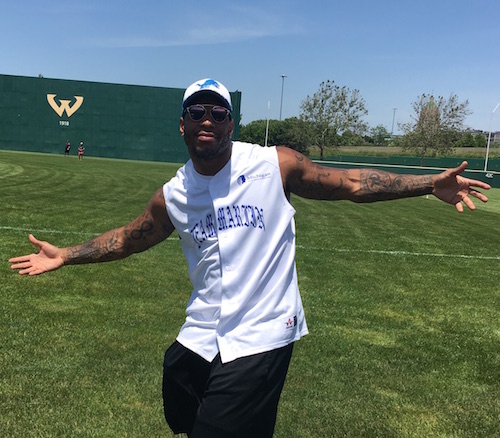 Lance Martinez from My Detroit Sports sends along this original photo of Lions tight end Eric Ebron. The up close look was gathered at a charity softball game, at Detroit’s Wayne State University, co-hosted by Lions teammate Haloti Ngata. Entering his fourth NFL season, Ebron’s catches and yards have steadily increased each year, posting 25, 47 and 61 grabs in his first three campaigns, along with 248, 537 and 711 receiving yards. In an interesting statistical anomaly, Ebron’s receiving TD’s went from one in his rookie season, to five in his second, back to one in 2016. No matter how you slice it, Ebron ranks among the top 15 current TE’s in the NFL. Lions fans can check out additional behind the scenes coverage of Ebron and other current and former members of the team, via this link.